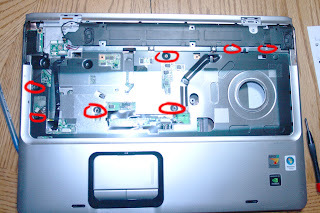 This is the Third Part of How To Disassemble the HP DV9000 series Notebook's / Laptop's Disassembly Tear-Down with photos. By now the bottom screws have been removed as well as the Quick Launch bezel and the keyboard. On to the top assembly. Now its time to take the top chassis assembly off..
Now its time to start taking the wires in the top chassis out of their keepers. This is the cable for the web cam. 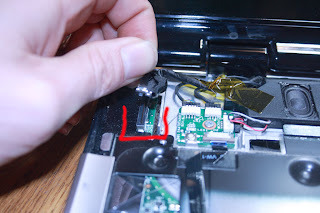 Disconnect it and remove it and the wifi cables back to the LCD screen. I did not show the WiFi cables being pulled out .. they come up from the bottom where you disconnected them before. At the top left is the LCD data cable ... gently pull on the included plastic tab. My suggestion here ... lift on the actual connector it self as well to help cause IMO the plastic may either break off or pull off. 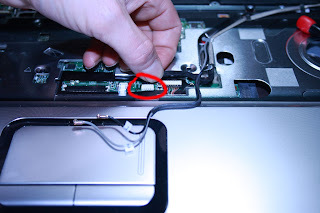 there are 4 connections to the power button board ... I would leave the ribbon cable that goes to the mother board attached but would remove the rest of the connections .... JUST remember where they go.... and I would remove the power button board from the unit as well ... this will make it easier for testing later. All you will have to do is attach the ribbon cable back to the system board to test functionality. 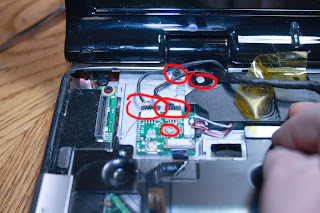 There are 3 screws on this side for the LCD to be removed and yes it will need to be removed to get to the system board. 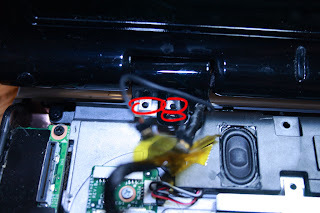 With the cables disconnected and out of the way you can see where the screws are removed. From the LCD panel. 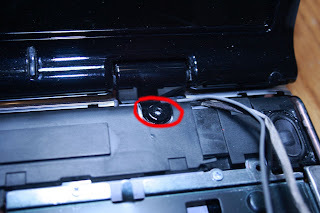 On the Right side there is only one screw left to release the LCD panel. Pull up on the panel very carefully make sure none of the cables get snagged anywhere .. and place this off to the side in a safe place ... remember these can be damaged very easily. Here is a top look with the LCD removed there are 7 screws to remove then with your finger nails / credit card mentioned earlier. go around the edges of the assembly to release it ... there are small plastic keepers that will snap like something is breaking ... as long as you gently do this you will be fine.. go all the way around till the assembly is loose and remove it. 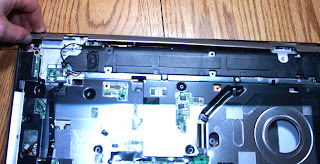 and remove the small strip of plastic that was under the LCD panel.